The SFM3400 flow sensor is a proximal flow sensor for pediatric and neonatal applications in respiratory devices such as anesthesia or ventilation. The sensor is available as a single-use version (SFM3400-D) as well as a reusable version (SFM3400-AW). The reusable solution is washable and autoclavable. The SFM3400 flow sensor provides exceptional measurement accuracy, a short signal processing time, and high robustness. The digital flow sensor measures bidirectional flow rates of up to 33 slm and is completely calibrated for air, O2, and N2 gases. The flow channel’s special design results in a low dead space volume of less than 1 ml. The sensor features typical medical cones for pneumatic connection to the respiratory cycle and has a mechanical interface for a user-friendly and simple electrical connection. Thanks to its performance features, the SFM3400 mass flow meters are perfectly suited for proximal flow measurements in pediatric and neonatal OEM applications, emergency situations, ventilation in hospitals, and home care applications. Similar to all sensors of the successful SFM3xx platform, the SFM3400 is based on the groundbreaking CMOSens® Technology, which integrates the sensor element and processing electronics on a single, small CMOS microchip. The CMOSens® mass flow sensors deliver robust and interference-free measurements and allow utilization of the very rapid and precise sensor signal. 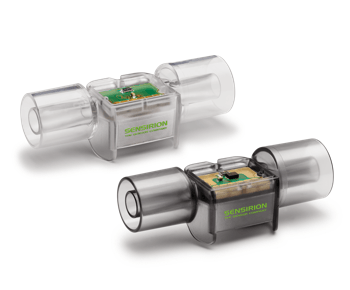 The product range from Sensirion includes proximal flow sensors for respiratory applications for adults. The sensors are available in single-use and as reusable models.